Roman Nyman was born as part of the same generation as Konrad Mägi and Nikolai Triik and similarly to those two artists, he also studied at the Stieglitz drawing school in St. Petersburg, where future draftsmen were trained. Like the others, he also travelled to Paris, Italy, Germany and Norway but he still did not develop into a beginning of the century modernist. 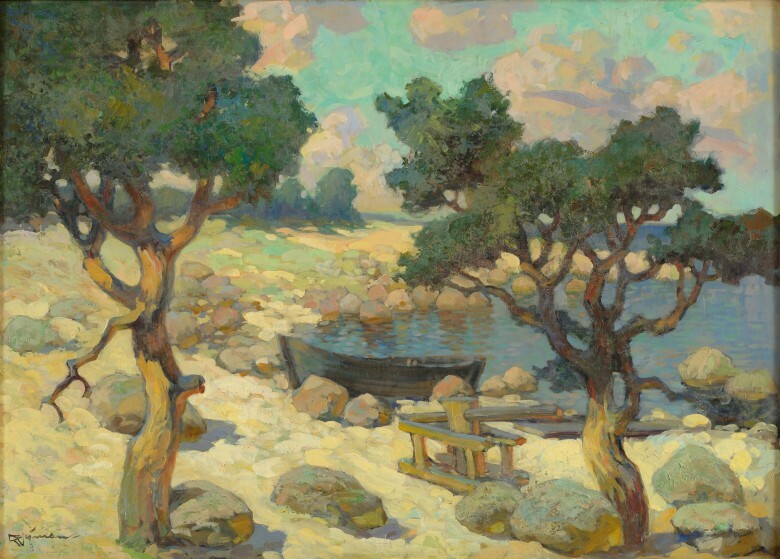 Focusing primarily on stage scenery and painting landscapes, Nyman developed into a teacher and a pop artist in both the theatre and painting during the era of Estonian independence. Pure, warm colours, contrasts between light and shadow, decorativeness, the depiction of natural settings from his Estonian homeland and peace and stagnation were his trademarks through to the end of his creative work. “It appears as if the landscape had posed for the artist. Not even a breath of wind or the smallest wave can be felt,” researchers have written. Of Roman Nyman’s body of creative work from the 1920’s, primarily his works completed in Southern Europe are known. The largely different, soft southern light captivated him there. Strangely enough, we can also see similar light in this work that is undoubtedly based on Estonian subject matter. Nyman readily depicted coastal pine trees and coastal natural settings throughout his creative work. 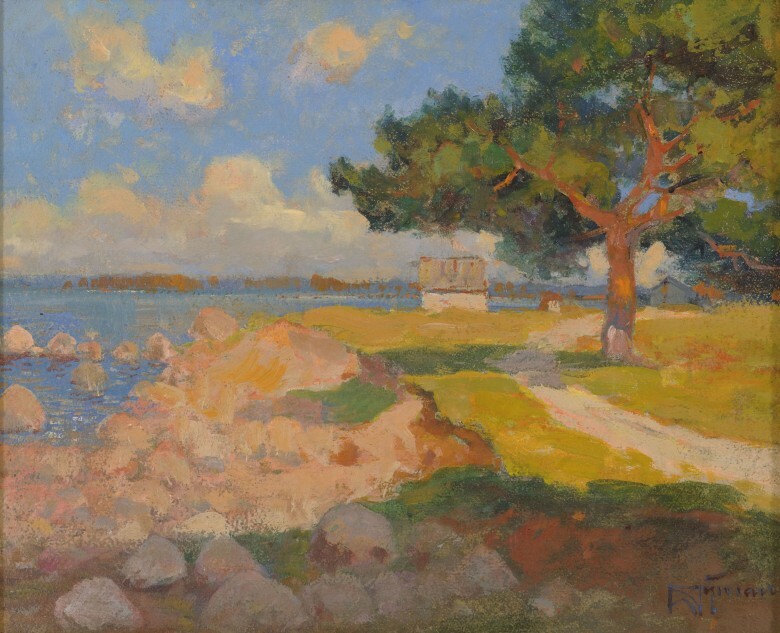 Many other Estonian painters have also actively painted pine trees. For instance, Toomas Vint has several works where pine trees form the background. In addition to the picturesque contrast of the pine tree’s trunk and needles, the pine tree’s reaction to changes in lighting has also apparently charmed artists. As the angle of light changes, the orange of the pine tree’s trunk also changes, and this has probably also charmed Nyman in the case of this work as well. Roman Nyman travelled a great deal during his life: he went to study in St. Petersburg at the age of 19 and with the support of a scholarship he received for earning good grades in his studies, he travelled a few years later via Berlin to Paris, back to Berlin from there and on to Italy, from where he went back to Paris again. Yet that was just the beginning. In the coming years, shorter and longer trips were to take him to Norway, Paris, London, Munich, Italy, the Vatican, St. Petersburg, back to Italy, Berlin, Spain…Even though Nyman’s trips abroad became less frequent in the latter half of the 1920’s, he participated in an important art exhibition in 1927 with six Tyrolean (Austria) views. Since he was by then a well-known theatre backdrop artist already (for instance, he created the stage design for the Estonia Theatre’s opening stage production of Hamlet), Nyman also built this view of the landscape up like a stage backdrop with two wings on the sides. According to the new Soviet principles in 1940, Nyman had quickly set about painting turners of metal, factories, portraits of Stalin and Lenin, but also posters and slogans. 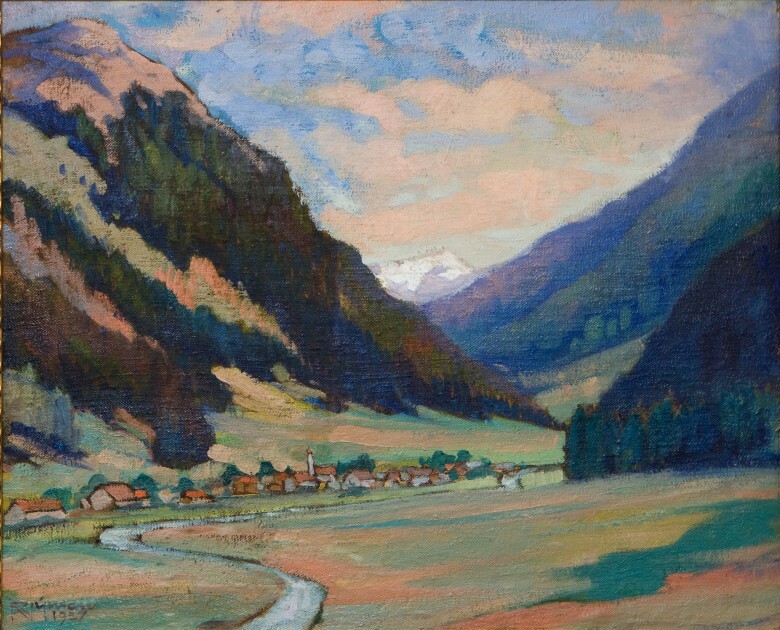 During the German occupation, however, he frequently filled commissions for German officers, who often sent paintings to their homefolk instead of photographs. It can be seen from Nyman’s notes that the Germans paid for views of Hara and Kaberneeme located in Northern Estonia in kind, such as cheese, sausages, quality tobacco and expensive drinks.